Q&A: What question makes you anxious? Being asked to speak to a crowd. I can talk to a room on my own terms, but get so nervous with expectations to deliver… perfect intro to my morning. I got to work early, enough to see parents dropping off their kids, walking with them, and talking with other parents while their kids ran around and ate breakfast. Today was Family Fun Friday, an opportunity for parents to join their kids in the classroom to witness the reading, math, crafts, etc., and then share some time doing it together. I got invited into the first grade class and we read part of a story, Enemy Pie, and asked questions about the pictures, the pages as they were read, what the kids predicted would happen, and how the characters felt about their situation. Next was Coffee Chat with the principal. There was plenty of cream and sugar along with pink pan dulce, strawberries, and watermelon. I listened in and talked with a parent. It’s great to get their POV and gauge their interest in their kids. Then it was time for the Wellness Meeting and there was still 25 attending parents, about five or so had left. I went upstairs to make copies of the three handouts and then Jorge, my co-worker, passed out a brochure about the 5210 Program. We let the boss do most of the talking and I said a few things when appropriate and helpful. We let the parents take measuring cups and reusable containers home – to help with portion size for the kids and get them to come back next month. A parent suggested we have donations of food and time to make other meals that their kids will eat and I think it’s a fantastic idea. One teacher tried it on her students today and when they didn’t like the food she invited the older kids in to have some too. It’s an easy way to find out what the kids like to eat and share that recipe with their parents. We were outside with the kindergarten classes and taught them about front and back movement while doing exercise, the location of their feet and knees, and let them run around learning to skip, gallop, and jog. We tried a new idea with the first graders and chose some star leaders who did fantastic using exercises and phrases that we taught them. It was so cute and heartwarming to see our hard work paying off. I was left alone at lunch today and managed over half the school’s students at once with only one bloody knee and no puking. The kids wasted less food today and the boss released me at 1pm with an “enjoy your weekend” message as he left. I got home and 30 minutes later we were on the road north. I knew we weren’t making good time only driving 20mph, but somehow stayed positive until Caleb told me we were still closer to home than our destination after 2.5 hours of driving. At one point, it took us a half hour to drive eight miles. We stopped in Victorville for fuel and dinner for all. Sparky had his usual cubes of ground up whatever flavor and we added beet salad to the mac-n-cheese. Dessert was pineapple-peach kombucha and chili-lime sunflower seeds. Watching the sunset while Caleb stares at boiling water, along with the fact that after four hours we had finally made it to the 395, made my cares melt away, but not so fast as it would take us another two hours to reach Fossil Falls, but without sitting in traffic. It’s hard for me to fathom how some people willingly choose that commute. We’re here for the night and Caleb is setting up. Time for me to grab the dog and possibly a jacket before sitting around a fire with cocoa or stumbling around in the dark around lava rocks before staring at the sky for hours (it’s the main reason we’re here). Caleb remembers the strong emotional attachment I have to this place every time. 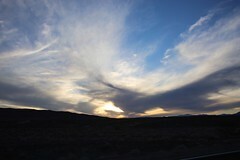 This entry was posted in Animals, Books, Camping, Education, Events, fitness, Food, Places, Things, Travel and tagged California, campfire, Fossil Falls, Hwy 395, Q&A, school. Bookmark the permalink. We tried, but without his sight it’s just not as much fun as it used to be.